MARK THIS IN YOUR CALENDAR!! YOU DON"T WANT TO MISS OUT! Over 200+ tables, tons of various endless vintage collectables and antiques: vintage advertising tins and signs, oil & gas, toys, radios, fishing tackle, hunting & sports memorabilia, post cards, old photos, LP records, medalta, orange crush, coca-cola, Pepsi, moorcroft, movie posters, brewerania, fruit jars, soda pop / ginger beer bottles, drug stores, ephemera, old tools, books, Fire King Jadeite, Chinese Asian artifacts, tobacco, dolls, jewelry, pottery, comics, coins, stamps, Hudson Bay, Chinaware, sports, general store items, small vintage furniture, etc. - you name it; it's here & you do not want to miss out! Regular Public Admission: $5.00 on Saturday April 27th & Sunday April 28th during regular show hours which are: Saturday: 9:00am-4:00pm; and Sunday: 10:00am - 2:00pm. 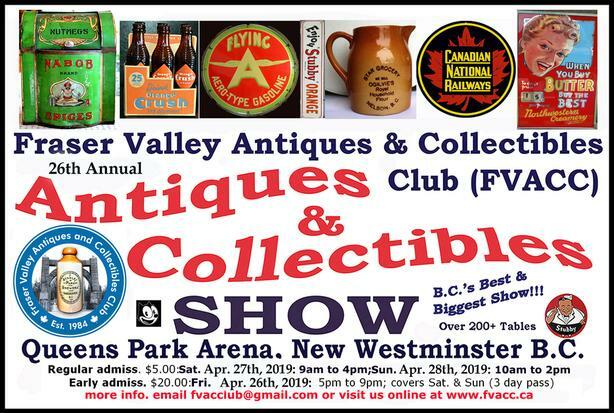 Dealer Set-up Early Entry Admission (Pre-show early entry): $20.00 on Friday Evening April 26th, 2019 - 5:00PM-9:00PM; Please Note: Dealer Set-up early admission allows you all 3 days admission to the show (i.e., Early Entry Time: Friday Night 5:00pm-9:00pm & during regular show hours on Sat. and Sun). Note: There is No Early Entry on Sat. or Sun.